When viewed from above the head is trapezoidal in shape and moderately broad; the upper longitudinal axes of the skull and the muzzle diverge slightly. Cheeks flat. Axes of the skull and the muzzle converging or appearing “dish-faced” is a fault. Viewed from the side, from occiput to stop, the skull should be longer than the muzzle. The skull measured across the area of the zygomatic arches is wide and equal to the area from the stop to the occipital crest, both being slightly more than 50 percent of the total length of the head (56 percent). Frontal sinuses well developed, marked arch of the eyebrows, the occipital crest is not very developed, the stop not too pronounced though the furrow between the eyes is pronounced. The ridge formed by the eye sockets is palpable from the eyebrows to the side of the head. The eyes are large, but never exaggerated, rounded, filling the socket, set fairly apart. The color of the iris ranges from ochre to hazel and dark brown depending on the color of the coat. Close fitting eyelids; eyerim color will vary with coat color from flesh colored to dark brown. Eyelashes very well developed. The Lagotto’s expression should be alert, keen and lively. Walleye(s), an eye with a whitish iris, a blue eye, are a disqualifying fault. The ears are medium-sized in proportion to the head, triangular with rounded tips; their base is rather wide; they are set just above the zygomatic arches. Hanging at rest or slightly raised when the dog is attentive. The ears when pulled loosely forward across the cheeks towards the nose tip should cover ¼ of the length of the muzzle. Muzzle is measured from eyes to nose tip. On the ears, the hair tends to show looser curls, but remains very wavy. Except where trimmed to the edges there should be no short hair on the ears. The inner part of the auricle is also covered with hair. The muzzle is broad in width, in length a little shorter than the skull (44 percent to 56 percent ratio). The muzzle is wedge shaped, giving a blunt profile. The nose is large with wide open and mobile nostrils. Median groove strongly pronounced. The bridge of the muzzle has a straight profile, a roman nose is a fault. Viewed in profile, the nose continues on the same level as the muzzle and protrudes very slightly from the front edge of the lips. Color will vary with coat color from flesh colored to dark brown. The nose should be fully pigmented. A de-pigmented nose is a fault. The lips are not too thick; they are rather tight, so that the lower profile of the muzzle is determined by the mandible. They are covered with a long and rather bristly moustache.Color will vary with coat color from flesh colored to dark brown. The flews are tight fitting and dry. Strong under jaw which is relatively large with white and well developed teeth. Reverse scissor bite, scissor bite or level bite are all acceptable. Overshot bite and extreme undershot bite (more than a ¼ inch space between the upper and lower incisors) are both disqualifying faults. Full dentition is preferred. No more than one missing tooth. The missing tooth to be allowed only between P1-P4. Any tooth missing other than a premolar or more than one missing tooth is a disqualification. Shoulder - shoulder blades long (30 percent of the height at withers), well laid back (52 to 55 degrees), muscular, strong and closely attached to the chest, but moving freely. The angle formed between the shoulder blade and the upper arm should be 110 to 115 degrees. Upper Arm - muscular, of thin bone structure, as long as the shoulder blade; its inclination to the horizontal ranges from 58 to 60 degrees. Elbow - tucked firmly against the brisket; covered with thin skin. Parallel to the median sagittal plane (means in line with the spine) of the body as are the upper arms. The tip of the elbow is located on a vertical line lowered from the back end of the scapula to the ground. Forearm - perfectly vertical, long (36 percent of the height at withers), with compact, strong bone of oval cross-section). Carpus (wrist) - viewed from the front in a vertical line with the forearm; fine, robust and mobile; the bone of the carpus markedly protruding. Pasterns - rather less thick and of finer bone compared with the forearm. Seen in profile, slightly sloping (They form an angle of 75 to 80 degrees with the ground). Dewclaws - must be present on the front legs. Missing dewclaws are a disqualifying fault. Forefeet - slightly rounded, compact, with well arched and tight toes having well developed webbing between the toes. Pads are fully pigmented. Nails are strong and curved and may range in color from white to so dark a brown as to appear black. FAULTS Any departure from the foregoing points should be considered a fault and the seriousness with which the fault should be regarded should be in exact proportion to its degree and its effect upon the health and welfare of the dog and on its ability to perform its traditional work. Click Here to Learn about breeder background checks on Lagotto Romagnolo breeders if you are looking for Lagotto Romagnolo puppies for sale. Click Here to learn how ResearchBreeder.com can help you find healthy Lagotto Romagnolo puppies for sale. Click Here to order a Breeder or Kennel Background Check on Lagotto Romagnolo Breeders that may have Lagotto Romagnolo puppies for sale. 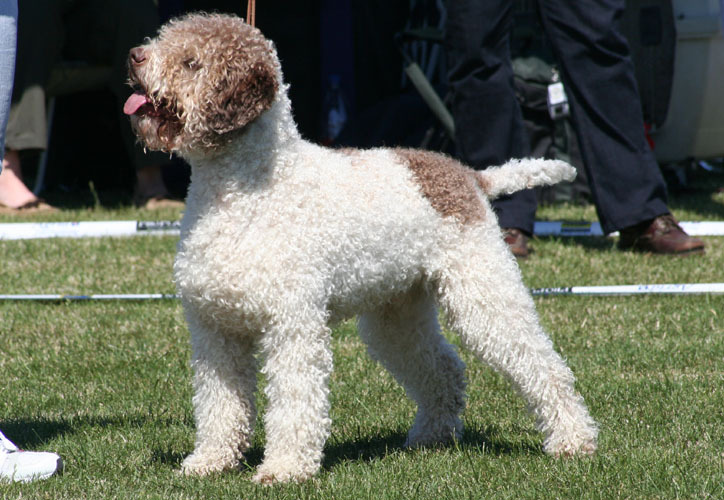 Click here to find the national breed club for Lagotto Romagnolo puppies for sale. Click Here to purchase a list of approved ResearchBreeder.com Lagotto Romagnolo Breeders who have Lagotto Romagnolo puppies for sale.